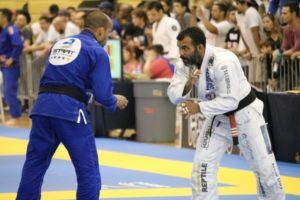 Brazilian jiu jitsu is a martial art,combat sport, and a self defense system that focuses on grappling and especially ground fighting. Brazilian Jiu-Jitsu is one of American Top Team’s core training programs. We have produced a multitude of champions in all types of competitions. This, all under the tutelage and watchful eye of Brazilian Jiu-Jitsu World Champion and living legend Ricardo Liborio and his 2rd degree black belt Master Junior. Considered by many to be one of the most technical black belts ever to come from the famed Carlson Gracie academy. 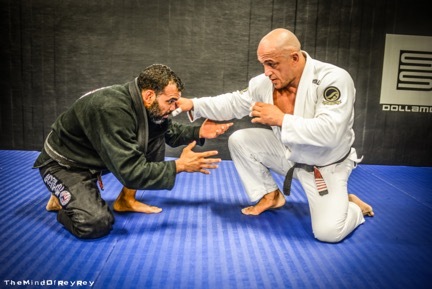 Master Liborio is a world class teacher and MMA coach, always striving to get the most out of his students. Brazilian Jiu-Jitsu is primarily a ground-fighting art. Most techniques involve both fighters on the mat. There is a heavy emphasis on positional strategy, which is about which fighter is on top, and where each person’s legs are. Positions are stable situations, from which a large variety of techniques are available to both fighters. American Top Team is excited to present the following programs to you. Whether you are new to training, just want to get back in shape, or have more competitive aspirations in mind, we have a program designed especially for you. We have your goals in mind, and will strive to meet and exceed them together in a safe, clean, & fun environment.